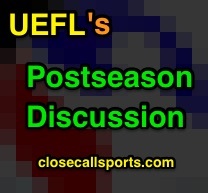 Discussion for the 2017 postseason's AL and NL Wild Card Games is now open. Home plate umpire performance is listed following the completion of each contest according to pitch f/x and UEFL Rules 6-2-b-a (horizontal bound, "Kulpa Rule") and 6-2-b-b (vertical strike zone, "Miller Rule"). Fouls, swinging strikes, balls batted into play, and hit-by-pitches are excluded from the analysis. Of the remaining callable pitches, the Definition of Terms shall govern: "A STRIKE is a legal pitch when so called by the umpire, which...passes through any part of the strike zone." - 10/03, MIN@NYY ALWC: Alfonso Marquez: pfx. 120/122 Balls + 46/49 Strikes = 166/171 = 97.1%. +1 MIN. - 10/04, COL@ARI NLWC: Jim Reynolds: pfx. 85/87 Balls + 47/52 Strikes = 132/139 = 95.0%. +1 ARI. NOTE: The highest plate score during the 2016 Wild Card Games was Gary Cederstrom's 95.8% (ALWC). NOTE: There was one Replay Review during the 2016 Wild Card Games (1/1 = 1.000 RAP). - ALWC: 1B Umpire Mike Winters rules Granite out on Castro's appeal for missing first base.